The image of a young woman jumps out at me – almost every inch of her skin is covered, by gloves, a jacket, a baseball cap and even her face is covered to the eyes by a bandanna firmly wrapped around her head. She has the job of lifting boxes of lettuce, work that was once reserved for men. Originally from Mexico, she now works on a farm in California just over the border in the United States. 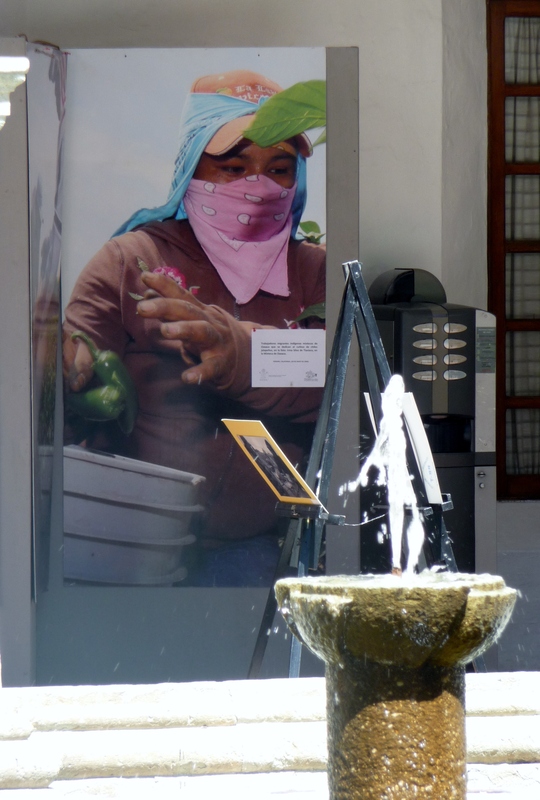 This is just one of the stories that I encountered today at the new photographic exhibition by David Bacon here in Oaxaca, called “Surviving – the life of farmworkers and their families in the US“. The pictures tell the story of Mexican migrants who have moved to the US in order to find farm work. Once they reach the US the living conditions are difficult, the work is laborious and they often live a precarious existence. The exhibition is travelling to parts of Mexico identified as having high migration to the US and aims to show people thinking of making the move what life on the other side of the border is like. 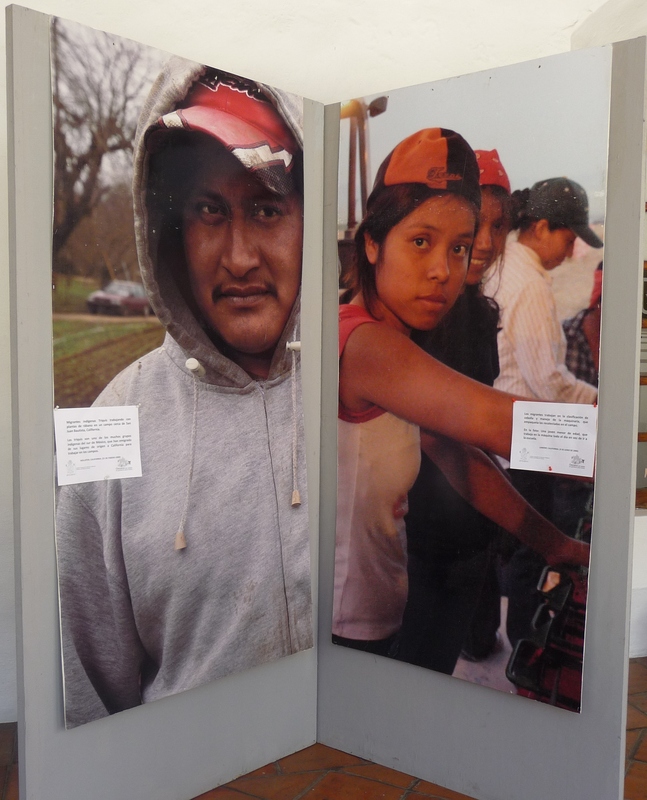 The exhibition includes mainly pictures of migrants from Oaxaca, most of them indigenous and from the pueblos (villages). In many pueblos of Oaxaca the population has declined due to emigration, mostly to other parts of Mexico but also to the US. The vast majority of those who make the journey to the US are men, but sometimes they make the difficult journey with their families too. 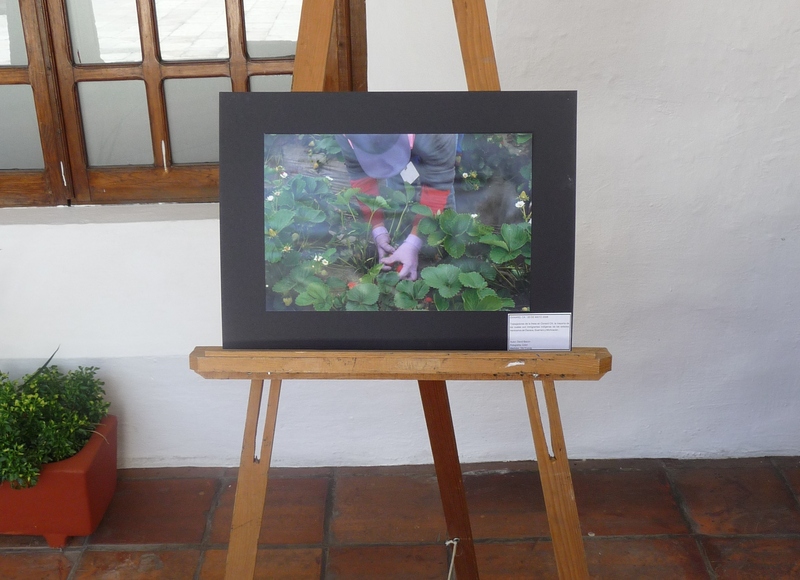 One of the women shown in the exhibition is Guillermina, a Mixtec woman from Oaxaca, who works picking strawberries in Oxnard, California. She works alongside her sister to support three other members of the family. All 5 share one bedroom in a house that is cohabited by other immigrant families. There is an image of another family who also pick strawberries in Oxnard – they are originally from Michoacán and they sleep 8 to a single room. Interestingly, by contrast in Mexico people on average have 4 people to a home (which most likely has more than one room) and in Oaxaca only a third of homes have more than 5 people in them. Aside from substandard living conditions, the migrants have little support and work in difficult situations. Some young people, not yet of the legal age to work, forgo attending school in order to make a living in the fields. Other young people only work after school, at least getting an education. The work can be laborious, whether harvesting the crops or packaging them up. Some women work lifting heavy boxes all day and it is a very difficult environment for women with small children. Poignantly, there is a picture of 5 men waiting beside the road early in the morning waiting to be offered work for the day. They are from Etla, a pueblo not far from Oaxaca City with just shy of 9,300 people. They now live in San Diego (which has a population of around 1.3 million) and like many migrants they don’t have a steady job but rather pick up what work they can on a day by day basis. Little is guaranteed about this way of life, as this exhibition tries to highlight to people considering starting a new life north of the border. 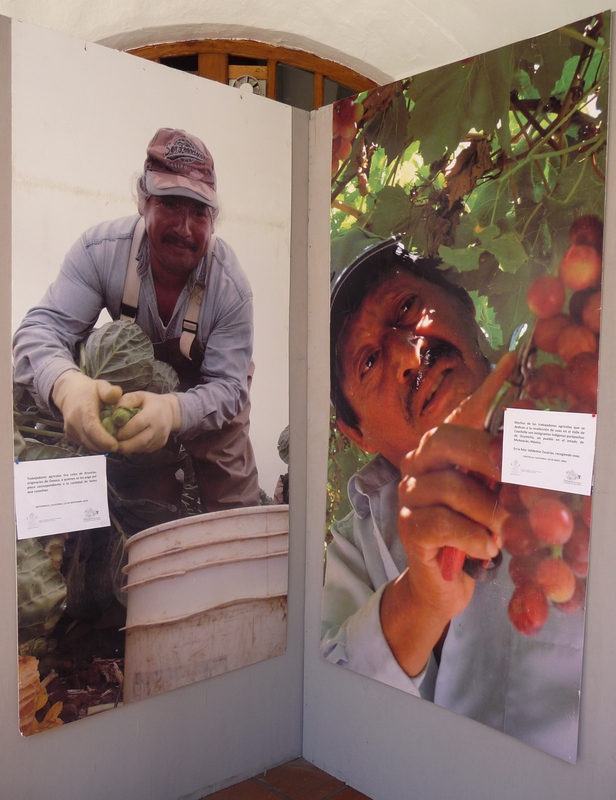 In the exhibition there is an example of people working to harvest lettuce for Ocean Mist’s farm in Winterhaven, California. Ocean Mist grow lettuce year-round at various locations, so often workers will travel from one site to the next in order to have full employment. On Ocean Mist’s website they boast that “We hand cut all our lettuce and hurry them to our facility to be cooled quickly.” This doesn’t convey any sense of the working/ living conditions of their employees, or of the toil and hard work to get produce to the point of sale. Here in Oaxaca I buy almost all of my produce at local markets, so I know that most likely my fruit and veg are grown nearby. Not only am I getting really fresh produce but I am also contributing to the local agricultural economy. Before moving to Mexico I lived in England and before that New Zealand. I shopped almost exclusively at supermarkets and didn’t pay much attention to whether my fruit and veg came from Spain, Brazil or California. Since living here I am much more aware of where my food is coming from and I have also had to get used to cooking with seasonal ingredients, something that has been lost from much of the western world. David Bacon’s photographic exhibition is useful not just for Mexicans contemplating farm work in the US, but it is also a timely reminder to the rest of us to really stop and wonder – where does our food come from? Previous PostWho are the Triqui? The complex world of indigenous resistance in OaxacaNext PostWill ‘Yo Soy 132’ change the face of Mexican politics? Excellent. Not many are talking about the working conditions of agricultural workers. I certainly don’t hear politicians mention it. Thanks – it’s a shame that it is an issue not more out in the open, especially here in Mexico. But would also be great to see something from politicians during the US election season!